This morning I was delighted to see that an article about Athena SWAN I co-authored with Charikleia Tzanakou has been pre-published online. Entitled ‘Moderate feminism within or against the neoliberal university? The example of Athena SWAN‘, the article reflects on findings from research undertaken by Tzanakou in 2013-2017 and myself in 2017, looking at the experiences of individuals involved in Self-Assessment Teams (SATs) for the Athena SWAN gender equality scheme. It will eventually be published in a special issue of the journal on the topic of ‘moderate feminisms’. You can read the article here (for free!) 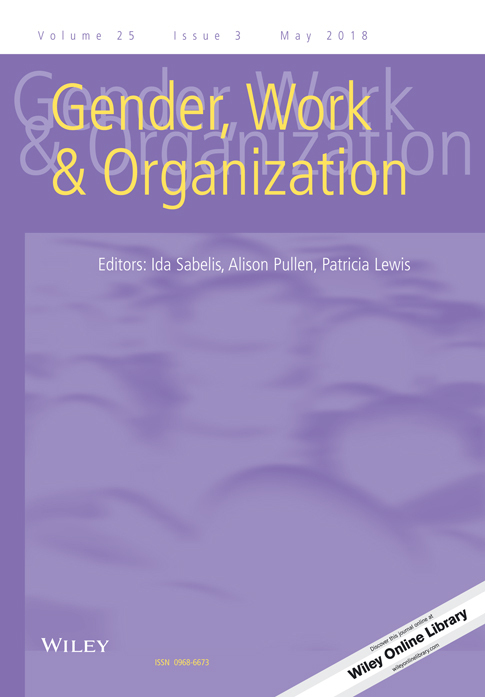 in the journal Gender, Work & Organization. Something we thought about a great deal when writing the article was our own ambivalence regarding Athena SWAN. On the one hand, we found that the scheme tends to play an undue burden on women, who are disproportionately represented on SATs and can face hostility from colleagues and managers for undertaking the assessment process. Some women even reported being threatened or turned down for jobs if their department, school or faculty failed to obtain an Athena SWAN award, even though this typically reflected the failings of the institution rather than the SAT. Women experiencing intersecting forms of marginalisation were particularly vulnerable, and trans people were rarely acknowledged at all. We regarded this as a consequence of the neoliberal context in which Athena SWAN operates, in which the scheme may be regarded as “just another metric”, a box-ticking exercise with a reductionist notion of womanhood. On the other hand, several participants did argue that Athena SWAN had helped to raise awareness of gender inequalities in their institution, leading male colleagues especially to take the issue more seriously. In some cases, SATs used the scheme to push for important changes, such as better support mechanisms and financial support for new parents, more diverse and intersectional curricula, and gender neutral toilets. Of particular benefit for this purpose was the requirement for continual re-assessment every few years should institutions want to retain their Athena SWAN award, or upgrade from Bronze to Silver or from Silver to Bronze. This requirement for re-assessment gives the award “teeth”, meaning that institutions can sometimes be actually held to account for actively pursuing the action plan they have to draw up in order to obtain an award. I also reflected on some of these negative aspects of Athena SWAN and potential benefits in a report published by the University of Warwick Centre for the Study of Women and Gender in 2017: Certifying Equality? – A critical reflection on Athena SWAN and equality accreditation. Ultimately, Athena SWAN is not simply “good” or “bad”. It is often implemented poorly, and suffers from operating within a neoliberal environment, but has the potential to be used as a tool for real change. Multiple actors are responsible for how the scheme works in practice. If you are a SAT member, I would urge you to see Athena SWAN not simply as a box-ticking exercise, but as a means through which universities might be required to change their practices and provide additional resources. Think about how your team might take a more intersectional approach to planning actions, and if you receive an award, use it to hold your institution to account. If you are a Head of Department/School/Faculty or otherwise work in university management, I would urge you to remember that inequalities abound in our institutions; Athena SWAN offers a real opportunity to reflect on and address this. Identifying the problem does not necessarily reflect poorly on your institution, but failing to act certainly does. Finally, I should note that there is currently an ongoing review of Athena SWAN, which closes on the 28th January. I encourage anyone with an interest in this topic to respond to it!